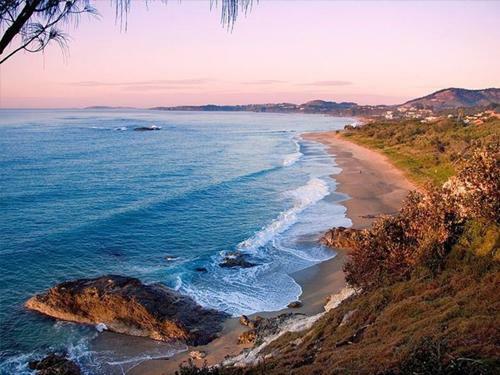 Delightful beaches on Coffs Coast. From gorgeous sheltered coves to challenging surf breaks, the Coffs Coast region has beaches to suit families and adventure seekers. If you're keen to learn to surf, there are accredited surf schools that will have you standing on a surfboard and riding waves in no time. Many of the beaches along the spectacular coast have excellent facilities, including picnic tables, barbecues, toilets and showers. You'll find plenty of beachside accommodation options too in and around Coffs Harbour, from resorts and retreats to holiday parks and camping grounds. Just north of Coffs Harbour, there are a few access points to the beach. Take the Sapphire Beach exit and gain beach access via Crystal Waters drive, which offers playground facilities, parking and beach showers. Or a little further along the highway turn off at Split Solitary Road through the new North Sapphire Shores Estate and you will find Beachstone Cafe, a fabulous kids playground, parking, toilet facilities and easy beach access. Corindi Beach is a great area for surfing, swimming and for snorkelling enthusiasts. The northern end of Corindi Beach is accessible via Beach Road. There is a local shop, tennis courts and a caravan park. The caravan park has picnic shelters, barbecue facilities, playground area, toilet amenities, and beach showers. There are also great rock pools for the little ones. The beach is patrolled for the summer school holidays. 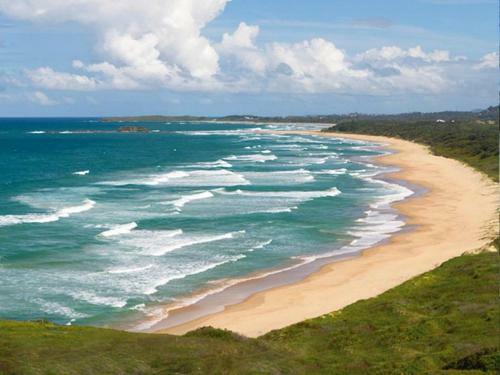 Boambee Beach extends from Corambirra Point near the Deep Sea Fishing Club, to Boambee Creek just north of Sawtell. The beach is not patrolled, though it is very popular among fishermen, horse trainers, joggers, jet-ski riders, and four wheel drive enthusiasts. Well-behaved dogs are allowed on the beach off the leash. 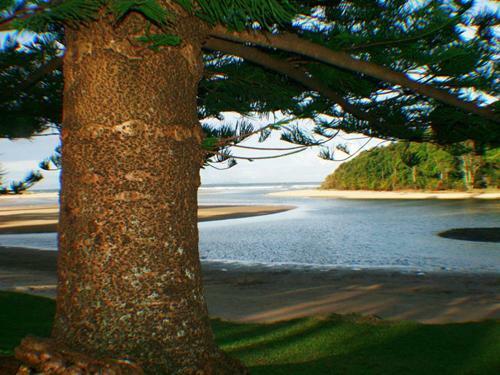 Boambee Creek Reserve, at the southern end of Boambee beach, can be accessed via Sawtell Road. It is a popular area for locals with younger children, due to the shallow water and warm natural pools. It is perfect for picnics as there are playground facilities, barbeques, shelters and takeaway food available. There are beach showers and toilet facilities. The reserve charges a nominal fee for car parking in the reserve. Boambee Headland is also the perfect location for whale watching during winter and spring. 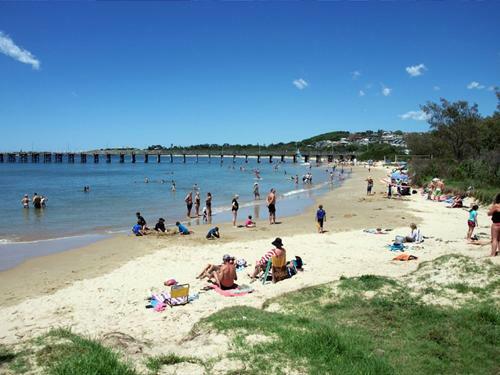 The ever-popular Diggers Beach is perfectly located for tourists – right across the road from Coffs Harbour’s Big Banana. Wide and sheltered, Diggers makes for a lovely wind-free beach walk. It’s not only visitors who love this beach either; it’s a favourite among locals for surfing, fishing and swimming. There’s plenty to do if you’d rather stay dry; take a seat at the elevated pavilion to admire the view and look at the birds, or you can walk the short pathway to Macauleys Headland. When you’ve had enough of the surf, take a break from the beach in the neighbouring Diggers Beach picnic area. Featuring a children’s playground and plenty of space to run around, it’s ideal for a family barbecue. 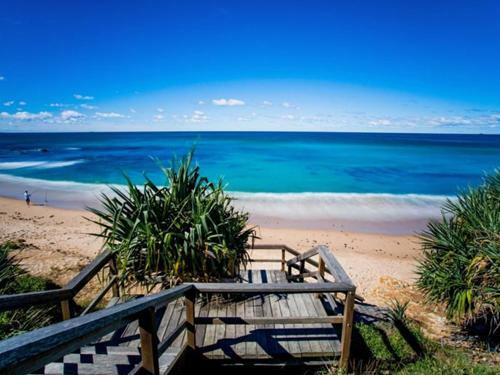 Positioned near Look-At-Me-Now Headland, 20 kilometres from Coffs Harbour and just south of Woolgoolga, Emerald Beach is a great destination for a family holiday. A local surfing hotspot, Emerald Beach is also a popular place for fishing, and for barbecues in the picnic area. It’s a quieter atmosphere than some of the other beaches along the Coffs Coast, as well as being a safe option for swimming. When the little ones are finished swimming, you can take them on a beach walk around to Look-At-Me-Now Headland or head to the playground in the park behind the beach. Emerald Beach caters for surfers too, boasting an excellent beach break, along with a southern left-hand reef break. You'll find Saltwater Cafe and Restaurant just behind the beach at Emerald. You can enjoy a meal while taking in spectacular coastal views or pick up a coffee to take on your way. Jetty Beach is a sheltered beach which is popular with both locals and tourists alike, especially families. At the edge of the sand you will find the Jetty Foreshores Park. The park has showers, toilets, barbecues, picnic shelter areas, pathways for roller blades and bicycles and children's playgrounds. The Foreshores area consists of the Jetty restaurant strip, Marina, Yacht Club, and the Deep Sea Fishing Club. The railway station is within close walking distance. To further enhance your visitor experience at the Jetty you can go snorkelling, fishing, visit the Harbourside Markets on Sundays, eat fresh seafood from the local Fisherman's Co-op, go whale and dolphin watching, go Jetty jumping, take a stroll along the Northern break-wall to Mutton Bird Island, and walk out along the newly renovated Southern breakwall and take in the views of the Harbour. Moonee Beach Reserve, where Moonee Creek meets Moonee Beach, is a popular area for both locals and visitors, especially those with smaller children. The beach is not patrolled, however the reserve offers shallow water for younger children and many parts of the creek are shaded by trees. It's the perfect place to sit and play in the refreshing clear water. 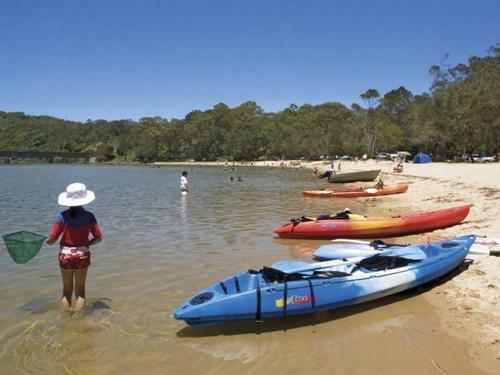 The reserve boasts many facilities such as a playground, picnic shelters, barbecues, toilets, beach showers, a takeaway shop and a caravan park, and it is very popular with fishing enthusiasts. A short stroll takes you across the creek to the headland via the boardwalk bridge and bush paths. Head south from Arrawarra to discover beautiful Mullaway Headland and Beach, near Coffs Harbour. Make the most of its picnic area and barbecues, go fishing or swimming. Mullaway Beach and Headland sit in a sleepy hamlet that’s highly regarded among fishing enthusiasts. Whether you spend your time at Mullaway fishing, swimming or bodyboarding, you’re bound to feel instantly welcome at this lovely beach. As well as great fishing and waves, there’s a small picnic area and children’s playground. 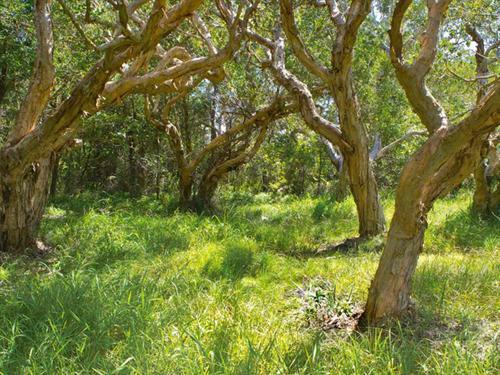 If you manage to catch a fish or two, you can cook them up on the barbecues and then relax among the paperbark trees while the kids play on the swings. Be sure to take the headland walk for sensational views – steep cliffs, rock ledges and Solitary Islands Marine Park are all stand-outs. Coffs Harbour's main surf beach is patrolled daily during most of the summer as Park Beach is the home for the Coffs Harbour Surf Life Saving Club. Park Beach is a popular area for water sports, fishing, and surfing. Swimmers should be aware Park Beach can be prone to strong rips particularly at the creek mouth. Park Beach is within close proximity to camping facilities, hotel and motel accommodation, cafes, restaurants, and the local shopping facilities. 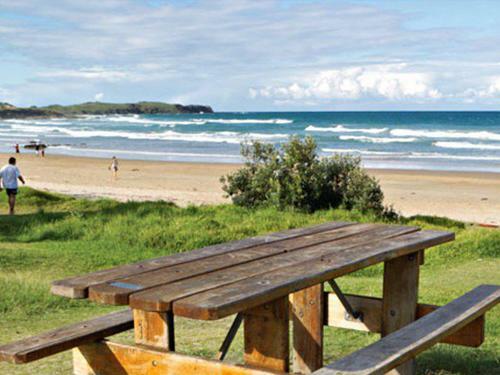 Adjacent to the beach car park is Park Beach Reserve, which is on the banks of Coffs Creek. The reserve is a popular family area for both visitors and locals. Park Beach Reserve boasts many facilities such as barbecues, picnic tables, children's play areas, shady trees, and toilets. Sawtell is a beachside community boasting a variety of visitor attractions including the main surf beach which is home to the Sawtell Surf Club. The beach is patrolled daily during most of the summer, and is a popular surf, swimming and fishing beach. The headlands are popular for watching the migrating whales and taking in the incredible coastline views. At the southern end of Sawtell Beach is Sailors Bay, an area sheltered by a small island which can be reached at low tide. Here there is a boat launching ramp, nearby parking, and tidal rock pools. Sawtell Memorial Rock Pool is situated on the south side of the Bonville Headland, and offers Sawtell’s residents and visitors a protected swimming environment. The beautiful ocean pool is a dedicated war memorial. Sawtell boasts an abundance of cafes and restaurants, boutique clothes shops, reserves, barbecue facilities, showers, toilets, popular picnic areas, children's playgrounds and a variety of accommodation facilities all within close walking distance to the main beach. 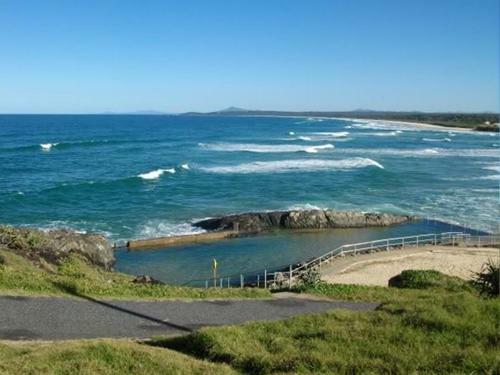 Also known as ‘Woopi’, Woolgoolga is renowned for its swimming, surfing, fishing, diving and snorkelling. 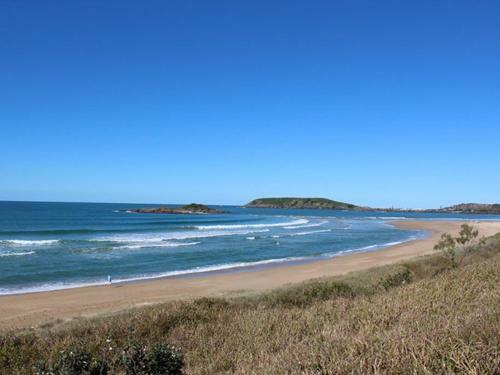 Woolgoolga Beach is home to the Woolgoolga Surf Life Saving Club and is patrolled daily during most of the summer. Woolgoolga Beach boasts a boat ramp, beach showers, toilets and change rooms, and tidal rock platforms which are very popular with children. There’s a small park nearby with electric barbeques, play equipment and plenty of shade for a picnic. The beach is within close proximity to cafes, a mixture of trendy, sophisticated and contemporary fashion shops, and all manner of accommodation. 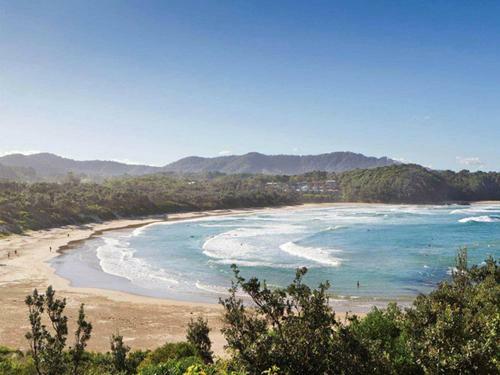 Up on the Woolgoolga Headland, you'll find scenic walking tracks and jaw-dropping coastal views that stretch to Yuraygir National Park and the sand dunes and rolling hills of the Coffs Coast and hinterland. Between May and October, Woolgoolga Headland is the place to be for the best whale watching in the Coffs region. Be sure to take your binoculars for up close views of these amazing creatures.